If you want to see stars outside of Hollywood, head to a Northwest winery. Across the region winemakers are increasingly courting rockers, artists and movie stars to help market premium wines. In the down economy, they hope a little rub of star dust will add some cache to the fermented juice. 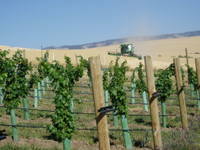 WALLA WALLA, WA - The bad economy has hit the Northwest wine industry hard. That’s especially true in the market for high-end wines. 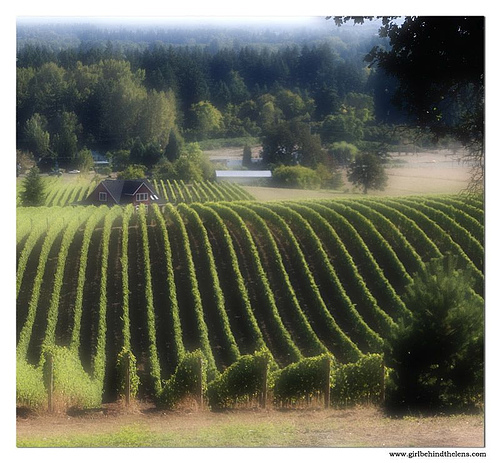 In the last 20 years, Washington alone has added 600 new wineries. Now, signs of stress are leaking out in one of the region’s wine hubs, the Walla Walla Valley. WALLA, WALLA, WA - Walla Walla is known as Washington's wine capital. But as the economy has faltered, a trend is emerging. Eastern Washington winemakers are heading West over the Cascades. They're opening tasting rooms in Woodinville wine country, near Seattle, to be closer to their customers. This week, as winemakers process their latest grape harvest, we're looking at how the wine industry is adjusting to the new economy. September 3, 2008 Weather for grape growers and for the rest of us will probably warm up through Friday. Saturday, a weak storm system might douse northeast Washington and Idaho. Next week it’s supposed to cool down again. In the Northwest and British Columbia, wine grape growers are slashing fruit off the vines. They are hoping that cutting down some of the bunches will sweeten-up the remaining grapes quicker. 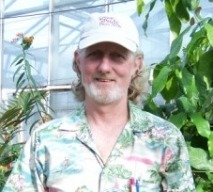 Ingo Grady is with Mission Hills Winery in Okanagan Valley. He has just a month and a half to harvest Cabernet, Syrah and Cab Franc grapes before the cold weather hits. GRADY: So that doesn’t give us a lot of time. It will be going from a nice sort of easy going beaches and peaches mentality to fire drills for the next six weeks. A late and small harvest means less money for growers, but it could be good news for connoisseurs. Paul Champoux grows Columbia Valley grapes for some of the Northwest’s top labels. He thinks ’08 could turn into a superb vintage, maybe even like the fabled ’99. CHAMPOUX: It will be interesting to see what this vintage turns out because of the Mother Nature we got this year. I think the grapes are tasting real well already you know. Still, Washington winemakers say they are most worried about ripening up their Cabernet. That’s one of the last varieties to be picked. Oregon grape growers are hoping for a dry fall that won’t rot their pinot noir. SALEM/The wine industry in Washington and California is supported by research programs at major universities. Now, Oregon growers are on track to get the same. Image taken by Jen Bebensee. Grapes Harvested by Hand, or Machine…Which is Better? RICHLAND/In wine circles there's a debate: man versus machine. We're talking about how the grapes are picked. Some say you can taste the difference between hand picked grapes and machine harvested fruit. Others say machines are an inevitable reality. 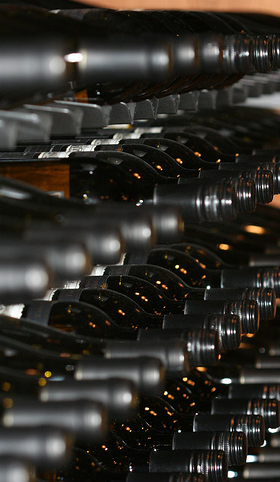 The wine industry is a relatively minor source of emissions, when compared to cars and power plants. But that hasn't stopped some in the industry from setting their own goals to reduce their environmental impact. WASHINGTON/We're all familiar with the grape harvest in the fall. But in summer a different kind of harvest takes place. The part few people ever see. Correspondent Anna King takes us inside Eastern Washington's bottling season. WASHINGTON/Washington State University is the region's top agricultural college. Now it wants to make its Tri-Cities campus the place in the Northwest to learn about winemaking.